Having enjoyed a Honda XL125S in my early teen years for a trailblazer I had a fair idea of what to expect from the Honda CB125E in terms of performance and reliability. The performance is of course less than spectacular however reliability and ease of maintainance is nothing short of excellent. Honda has made a few different air cooled 125cc engines over the course of the years, most of them are single overhead cam however I am aware of at least one overhead valve engine. All of these engines make around 7-11kw and have strong bottom end and mid range power but tend to run out of breath at higher RPM. At 7.6kw the Honda CB125E holds true to form, with a tractable bottom end, strong mid range and power tapering off above around 7000rpm. The CB125 lacks a tachometer so you have to ride it by ear, it does however have the maximum shift points for each gear marked on the speedometer and these I assume have been calculated based on the engines redline. The shift point for first gear is 22km/h, second is 44km/h, third is 64km/h, fourth is 84km/h and fifth (top gear) is allegedly good for 112km/h. This at least helps you make sure you arent running the engine into redline. As of the time of writing the fastest I have gotten my little Honda to go is about 105km/h. I do believe that it could go faster with a different rider. No, its not a question of skill, at 190cm and 125kg Im neither small nor light and with such a small engine changes in the power to weight ratio are distinctly noticable. This is a commuter motorcycle designed to ride around town economically and it is at around town type speeds that the Honda CB125 shines a lot brighter. Though filtering your way between the cars to the front at the traffic lights does introduce the risk of being run over by the car behind you when the lights change the CB125 is fairly nimble off the mark to 70km/h and will reach 80km/h quite easily even carrying my weight. Above 80km/h the bikes performance drops significantly, most likely because at this speed peak torque has been achieved and begins to fall off beyond this point. 90km/h is still very possible but beyond that requires a little patience to achieve and a hill of any decent size will slow you down to sub 90 speeds very quickly. I must add that the bike is fairly smooth around town for a four stroke single cylinder but tends to develop vibrations above 90km/h. Although these vibrations are minute and not in any way alarming they can be felt through the seat and handlebars and would contribute to rider fatigue over a longer ride (EDIT: one of the most noticable vibrations disappeared when the factory drive chain was replaced at 15,000km with an o-ring chain). Some of these vibrations are caused by the engine revving to preposterous rpm at these speeds and might be something that Honda will address in the future. Checking fasteners to make sure they are still tight is a good practice with this motorbike. High speed vibrations aside the Honda CB125 is comfortable to ride with a fairly low seat height and an upright riding position that keeps the weight off your wrists. I feel that it would be a good machine for all but the tallest riders. A fantastic alternative to a scooter I might add for those still considering their options, the Honda CB125 is comparable in weight to a scooter and probably more stable at speed to boot. The seat does take some getting used to and was especially ferocious to me as I had not ridden for many years. 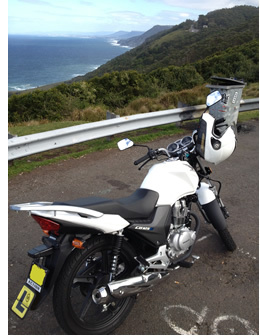 Other CB125 owners Ive spoken to report the same numbing effects on longer rides. My personal commute to work is 50 minutes or so one way so my behind has gotten accustomed to enduring it for this long and gets a reasonable rest before the return journey. Be prepared to walk like John Wayne until you get used to it though. When it comes to cornering the Honda CB125E handles well for a bike with rather outdated twin rear shock suspension and front forks that offer no adjustment. The rear suspension at least has five spring preload positions but other than that the suspension offers little in the way of tunability. Probably just as well as this might complicate things for its intended audience and it offers a comfortable ride for those who use it for its intended purpose as a commuter machine. This bike is light and can be thrown around a little within the limitations of the factory Kenda tyres and suspension however care must be taken in high winds where even heavier riders like myself can find themselves being blown around in the stronger gusts. Something to keep in the forefront of your mind when the weather turns stormy. The brakes are single hydraulic disk up front and mechanically operated drums on the rear that stop the motorcycle very effectively under most circumstances. They are more than sufficient considering that the CB125E is hard pressed to break the 100km/h barrier even with a single rider. Doubling on this bike does press the brakes perhaps a little but the additional weight of a passenger will ensure that you will not be stopping from high speeds. The instrumentation on the CB125 is a little sparse but not bad for a budget bike. Apart from the previously mentioned missing tachometer it has all the necessities, speedo, odometer (and trip meter), a fuel guage, turn signals, high beam warning light, neutral light and gear indicator. I feel the fuel guage is worthy of praise as it seems to be one of the better ones I have seen on a motorbike, it is consistant and does not float around giving a fairly accurate measurement of fuel in the tank although if the bike is left on the sidestand for a reasonable length of time the guage will read low. While riding along the guage is spot on and on my bike at least once the guage reaches the bottom of the red section on the empty end of the scale it will promptly hit reserve. Once the fuel tap is turned to the reserve position you know you have about two litres of fuel left. Now two litres of reserve is not a lot on some bikes however on the Honda CB125 it provides more than adequate warning and more than enough fuel to get to a service station in an urban environment. I have seen claims that this bike will give 2.4litres per 100km fuel economy but I find in practice that the fuel economy varies noticably depending on how you use it. When I first bought my CB125 I ran it around suburbia in 50km/h and 60km/h zones for the first 500km to run it in and found it capable of fuel economy comparable to this. My current commute to work on the other hand starts off with about 10km of 80km/h zone that graduates to another 10km of 100km/h zone before dropping down to mostly 70km/h and some 60km/h zones for another 30km or so. My commute takes the bike up to speeds which it is not really designed to sustain and it spends a lot of time at wide open throttle. In the 100km/h zone I just open it up wide and let it go. I find in practice I get at least 330km a tank before reserve under these circumstances. Chugging around town I see at least 380km before reserve.